Parols up for auction at KAPISANAN! 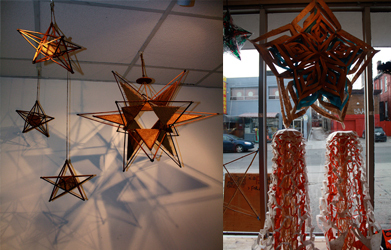 L to R: 3 stars & sun, starburst -- both by Jodinand Aguillon! Eric Q, Jodee Aguillon, Kristina Guison, and April Aliermo are just some of the artists whose parols will be up for auctioning at the Kapisanan Krismas event this Saturday, December 19th. Pictured here are only SOME of the parols up for auction! More images coming as the parols arrive at the K! Here are the details for the auction. 1. Auctioning will begin on December 17, Thursday , up until Saturday (19th). 2. Bids for each parol starts at $30. 3. You may start bidding online, by emailing giveback@kapisanancentre.com with your name, the name of the artist whose parol you want to bid on, and your phone number. 4. On Saturday, bidding sheets for each artist will be available at the centre. 5. Bidding will end at 7:00pm. For those who will start bidding online, please try to be at the event so as to secure your bids! 6. Winners will be announced at 7:30pm. Online bidders who win the parol will be contacted via the number they leave on their online bid. Remember, all proceeds from the auction go to the Children’s Rehabilitation Center as a part of Home for Christmas the second round of fundraising that will help the families back home get back on their feet after the devastation caused by typhoons Ketsana and Parma. Monetary donations (via PayPal or mailed-in cheques) are also still being accepted up until December 25. This Christmas, you can do so much both for yourself and others! Not only do you learn how to make a parol, you can also bid on a parol that gets you a piece of art while helping everyone back home. ~ by cpblardony on December 16, 2009.